Cityscape; image by Andreas Brücker, via Unsplash.com. Moving to another country is an exciting – and challenging – endeavor. These tips will help make it easier. No matter the reason for your decision to move to another country, it’s definitely a big change that comes with many challenges along the way. Whether you’re moving for six months, six years, or the rest of your life, the key to overcoming those challenges and making the transition as smooth as possible is actively doing your best to adapt to the new environment. With that in mind, here are six tips that should help you settle in. It doesn’t take much to make your new place feel like home. For example, you can decorate it with family photos, paintings, scented candles, and other accessories that remind you of your home. You can also invest in a few things that would make you feel more comfortable, like a quality toaster or some colorful plants. The point is to make your new home feel familiar, and only you know what that means for you. In the new country, some things will probably be done differently than what you’re used to. It may be better in some aspects, while it may also be worse or simply unfamiliar. Regardless of your first impression of such differences, try to keep an open mind. Try not to be too critical, and stay calm. After all, things often look much scarier and more complicated at the beginning. That being said, try not to glorify the positive differences too much either. All in all, once you accept the changes and get used to them, you’ll have a much easier time adjusting. As mentioned, there will probably be a few surprises, and sometimes, things might not go as well as you’d wish. This is why it might not be a bad idea to do some research before you move. Potential issues range from figuring out how to use the public transport to making sure you’re paying all your taxes correctly. Moreover, there will always be details that are related to social customs. Of course, you can ask your new neighbors for advice after you settle in, but still, they won’t always be around. Luckily, there are many expat blogs and forums that can provide you with invaluable information and suggestions. So, do your research online, and fill in the gaps through experience. Getting involved is a great way to not just learn more about your new home but also meet new people – some of whom might also become your new best friends. So, think about your interests and hobbies, and sign up for classes. It can be anything, as long as there will be other people as well. The point is to put yourself out there and start building your network of friends. This counts for your kids as well. For example, if you’re moving to Hong Kong, there are great education centers, like Monkey Tree in Hong Kong, where they can improve their English and make new friends. 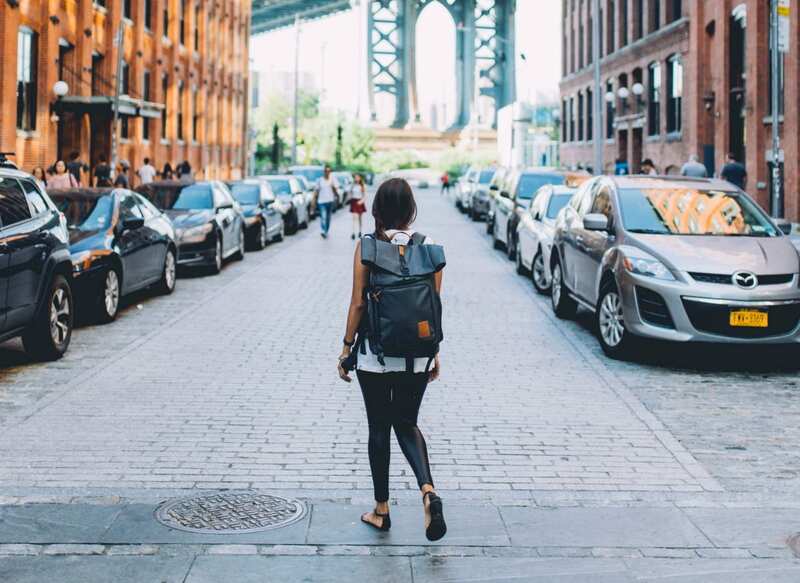 Woman wearing backpack standing on a cobblestone road; image by Brevitē, via Unsplash.com. When you’re new in the city, one of the best things you can do is act like a tourist and explore your new environment. Go to museums, go shopping, taste the local food, and go on sightseeing excursions. It can give you an insight into the history and culture of your new home. It can also help you find your way around by using the more familiar sites as your own point of reference. This way, you’re bound to feel more comfortable in your environment. One of the most important things when settling into a new city is knowing who to call when you need something done. Therefore, it might not be a bad idea to find those people before you actually need them. This is especially important if you’re moving to a non-English speaking country, as you might want to find English-speaking service providers. This way, you’d feel more comfortable, and you’d also have an easier time explaining your needs and problems. Regardless of the language, some of the more important service providers you should find as soon as possible are a doctor, dentist, hairdresser, plumber, general handyman, and electrician. Of course, you may add a few more depending on your personal needs, like a babysitter or pet sitter. Again, just make sure to find them before you actually need them, as you don’t want to be looking for a doctor when you’re too sick to get out of bed. Settling into a new country can be a difficult and stressful process. There are many things to think about, and sometimes, you may start feeling lonely and lost. However, by following the listed tips and staying positive, you’ll start enjoying your new home before you know it. Sophia Smith is beauty and style blogger, an eco-lifestyle lover, graphic designer and a content creator. Design plays a huge role in her personal expression. Sophia writes mostly about lifestyle-related topics in her blogs and articles. She has contributed to a number of publications including: Cause Artist, Optimistic Millennial, Soar Collective, How to Simplify, and Carousel. Facebook, Twitter, and Google +.